Website builders like Weebly make it easy to create a beautiful website or eCommerce store, even if you don’t know how to code. 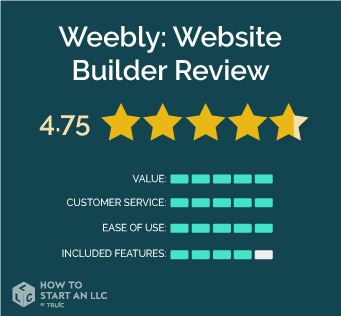 In this review, we’ll go over the details of Weebly’s web-building platform and explain how it compares to other website builders on the market. Read on to find out if Weebly is the right choice for you. Weebly is the best of both worlds when it comes to user-friendliness and customization capabilities. Their simple drag-and-drop design interface allows you to get a website up and running without touching any code, but doesn’t inhibit you from customizing your website to your liking. Weebly’s customer service is also top-notch, with email and chat support for all users and phone support for premium members. Who is Weebly right for? Weebly allows users to make adjustments to their site design (including changing themes) on-the-fly, without needing to fully recreate the website. Their platform is well-designed and easy to use, even for folks without any coding knowledge. Weebly can support high-volume and high-traffic websites, with unlimited levels of navigation. Their website themes are mobile-optimized and intuitively designed. Weebly does not release new features as frequently as some of their competitors, such as Wix. Starting at $12/month, Squarespace can give you a clean, distinct looking website. Weebly offers five different web-building packages: Free, Starter, Pro, Business and Performance. Each plan is designed for a different set of needs, from personal use to eCommerce. Take a look at what each package costs and includes below! Who should purchase Weebly's Free plan? The Free plan is a good choice for individuals in need of a very basic website, or those simply hoping to get familiar with Weebly’s platform. It’s important to keep in mind that this package comes with a Weebly subdomain and displays Weebly ads, so it won’t allow you to create a fully-branded website. Who should purchase Weebly's Starter Plan? The Starter plan is a great option for individuals or businesses that are ready to craft an online presence via a basic website or online store. This package offers a free custom domain and removes Weebly ads, so users are able to fully control their site branding. Who should purchase Weebly's Pro plan? The Pro package is best for individuals or businesses in need of a few extra features, such as a larger allowance of members and product listings. Who should purchase Weebly's Business plan? The Business package comes with a significantly higher price tag than any previous plan. However, the amount of upgrades it includes makes this package worth the extra cost for growing eCommerce stores. Who should purchase Weebly's Performance plan? Lastly, the Performance package is best for businesses seeking the most robust set of eCommerce capabilities Weebly has to offer. Performance is Weebly’s most expensive plan by far -- but again, it’s well-worth the investment for certain businesses. All of Weebly’s web-building plans are designed to allow novice users to create beautiful websites with ease. That said, their Starter, Pro, and Business packages all offer particularly great value for folks in need of affordable but reliable eCommerce functionality. We won’t repeat the massive array of features Weebly has to offer, but basically, all of their packages provide excellent versatility and value. Regardless of the plan you choose, your Weebly website will be clean, mobile-optimized, and able to handle a large number of pages. With email and chat support in every package, and phone support in most, Weebly’s customer service is pretty top notch. Weebly receives consistently high user-ratings when it comes to customer support, which is always encouraging to see. Once again, Weebly is super user-friendly. Their drag-and-drop design function makes it super simple to design a beautiful website and plug in all the features your business requires. Plus, unlike Wix, Weebly allows you to switch templates after launching your site and export your work at any time. The volume of features Weebly offers (outlined above) for such an affordable price is unmatched by any other website builder on the market today. One of the only drawbacks of Weebly’s design platform is that it doesn’t include H1 headings. Given the super-clean design of their layouts, this isn’t really an issue for most users, but we’re still going to knock their score down to a 4/5 in this category. Weebly has excellent web-building solutions for everyone from personal bloggers to full-fledged eCommerce businesses. Their platform is simple but effective, and highly flexible. Folks who are looking to build a beautiful website and small online store can do so for under $10/month, which is pretty incredible. If you’re anticipating running a super high-traffic online store, you may consider Shopify’s more specialized eCommerce services. Otherwise, though, we’d highly recommend Weebly for your business!